BIG (Brannon Industrial Group) is a family-owned Texas business leading the way with innovative solutions, better customer service, high returns and the highest standards of sustainability. 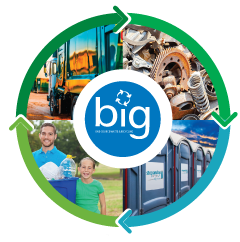 BIG provides municipal, residential, commercial and industrial waste management, recycling, metal recycling, portable sanitation and auto crushing. We founded BIG to bring innovation to an industry that hasn’t changed in 50 years. With my family and our team, we are dedicated to bringing cutting edge solutions, integrity and a focus on serving our customers in every aspect of waste diversion and recycling.